LibX PUL is a web browser plugin/extension/add-on for Google Chrome and Firefox that provides direct access to selected library resources, plus other useful features. It will change your library research experience for the better. Reference management systems allow you to import, organize, and annotate citations from library catalogs and databases and the Internet. They also sync across multiple computers, allow the easy generation of bibliographies, and in some cases work within Microsoft Word and LibreOffice to add citations. If you see an article you like in a database, for example, click a button and it's added to the program. Organize citations into folders; click on a folder to generate a bibliography in the citation style of your choice. File syncing programs allow you to save files to a drive on your computer that will be stored in the "cloud" and synced across multiple devices. They work like regular drives, so there's no uploading. You can sync a folder with multiple services. Working on that important project? Sync the folder with Dropbox, and then sync the dropbox folder with Sugarsync. That way your documents are on multiple computers and clouds. From the creator of Zotero; helps organize and annotate research photos from archives, etc. Text copied from PDFs often has line or paragraph breaks you need to remove before pasting that text into something you're writing. Text Fixer strips out those line breaks. 2) Download or upgrade to Zotero 5.0 and the connector for Google Chrome, Firefox, or Safari. 4) Move all your saved files and folders with digital articles and ebooks to the Google Drive folder. You can keep whatever folder organizational structure you have already and just move everything into Google Drive. 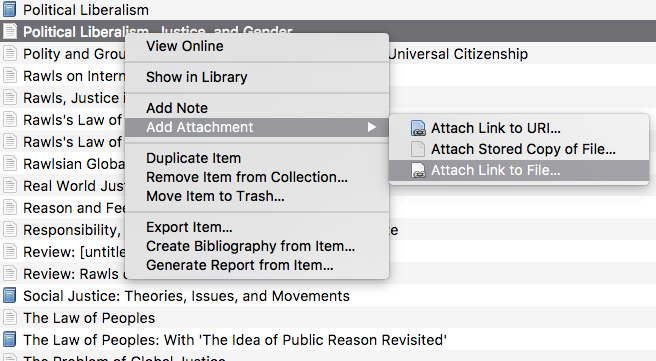 5) In Zotero, right-click on a citation for which you have a saved digital file, then choose Add Attachment, then click Attach Link to File. Find the appropriate file in the Google Drive folder and attach it. 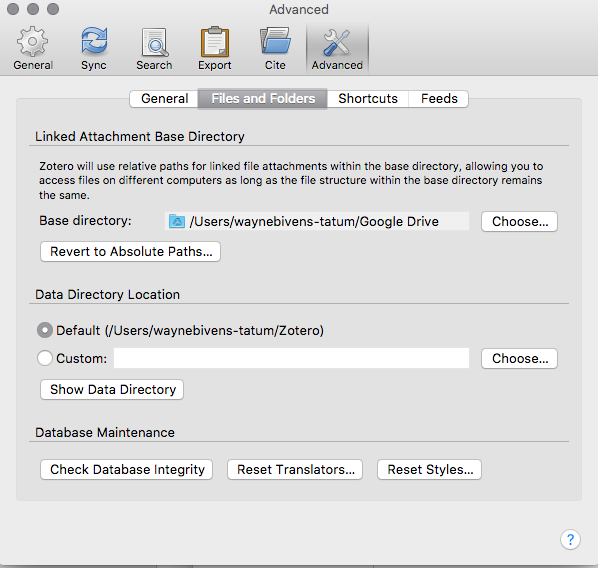 6) Once you've attached the link to the file, as long as the settings are correct and the same on each computer, Zotero and Google Drive should synchronize with whatever computers you use, and the file should be retrievable through Zotero.